"Will any one of you who has a servant plowing or keeping sheep say to him when he has come in from the field, "Come at once and reline at table?" Will he not rather say tho him, "Prepare supper for me, and dress properly, and serve me while I eat and drink, and afterward you will eat and drink?" Does he thank the servant because he did what was commanded? "We are unworthy servants, we have only done what was our duty." It has been years since I have had my feet washed. 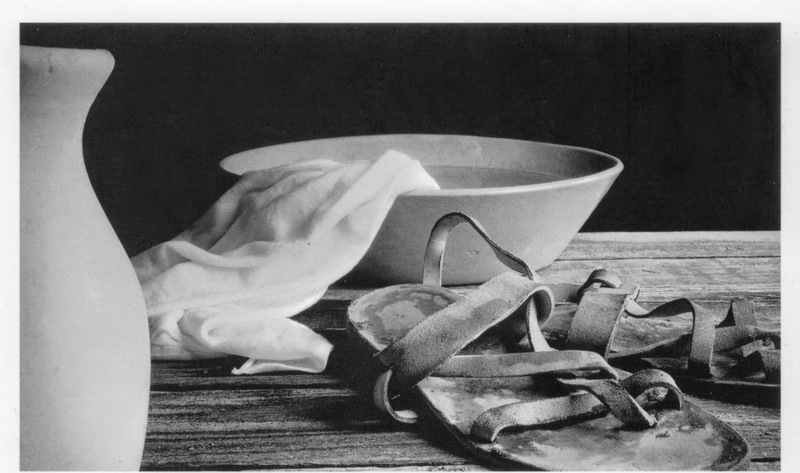 Foot washing is not practiced in our culture. But the very act of foot washing is steeped in symbolism. This morning, I had my feet washed. This sweet gal prayed over me and read Scripture over me, while washing my feet. It was a precious time. Her words spoke to my heart. Her timing was totally of God. It followed on the heels of a difficult evening. The kids & I had dinner at some friends house. putting toys in each other's drinks... Shall I go on? I put them to bed ... in my anger. I felt shamed and embarrassed by their behavior, and my inability to stop them. I was reeling over how I was going to discipline them when I went to bed. This morning, as I sat with my feet in a bucket of water, I was convicted. She was reading Scripture about forgiveness. The passage in Matthew 18 cut to my core. "Therefore the kingdom of heaven may be compared to a king who wished to settle accounts with his servants. When he began to settle, one was brought to him who owed him ten thousand talents. And since he could not pay, his master ordered him to be sold, with his wife, and children and all that he had, and payment to be made. So the servant fell on his knees, imploring him, "Have patience with me, and I will pay you everything." And out of pity for him, the master of that servant released him and forgave him the debt. But when the same servant went out, he found one of his fellow servants who owed him a hundred denarii, and seizing him, he began to choke him, saying, "Pay what you owe." So his fellow servant fell down and pleaded with him. "Have patience with me, and I will pay you." He refused and went and put him in prison until he should pay the debt. When his fellow servants saw what had taken place, they went and reported to their master all that had taken place. Then his master summoned him and said to him, "You wicked servant! I forgave you all that debt because you pleaded with me. And should not you have had mercy on your fellow servant, as I had mercy on you?" And in anger his master delivered him to the jailers, until he should pay all his debt. So also my heavenly Father will do to every one of you, if you do not forgive your brother from your heart." I have been forgiven much. And yet, sometimes I choose to withhold forgiveness. I have been forgiven ALL my debt. I am an unworthy servant, who must do my duty. I must forgive much, others who are unworthy.